I consider them to be conversation starters, in the least - the small white sign in my front garden that states, “I choose renewable energy”, or the sticker on my front door reading “Bullfrog powered”. I admit, I get a thrill when I am asked to explain “how it all works”. Fortunately as a valued customer (my chosen adjective as well as theirs), Bullfrog Power arms me not just with the gear to advertise and advocate for my choice in renewable energy, but also the knowledge and understanding of what my extra cents per kilowatt hour are actually funding. Yes, I choose to pay more on top of my existing electrical bill (and since becoming a homeowner, on top of my gas bill as well) so that Bullfrog can inject power back into the energy grid on my behalf that comes from a blend of wind and low-impact hydro power sourced from new Canadian green energy facilities. That’s 100% pollution-free renewable energy that acts like juice or tonic, diluting the potent cocktail of dirty power sources (oil, gas, coal) that leave a lasting impact on the environment through toxic waste. And all of that waste is in addition to the devastation to local ecosystems caused by large-scale hydro. In short, the fallout of using regular electricity is like one big eco-hangover that you can’t fix with some Gatorade and an Advil. Likewise, the green natural gas that Bullfrog injects back into the national natural gas pipeline on my behalf is also a climate-friendly alternative, pulled directly from our own waste in a Canadian landfill, not only displacing the regular gas sourced from fossil fuels but also reducing the carbon dioxide emissions dashing up into the atmosphere. It’s pretty innovative and makes for interesting conversation over drinks or around a dinner table. 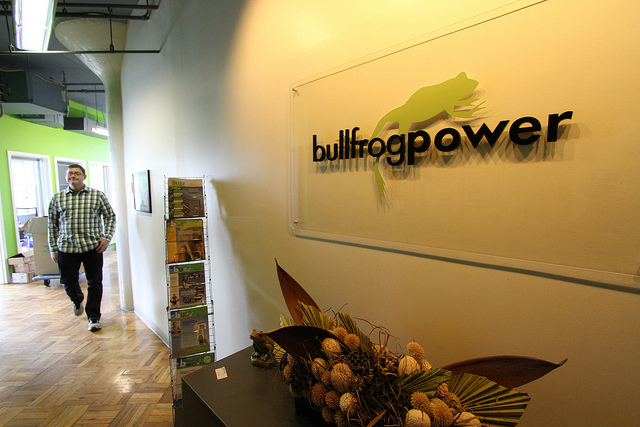 In May 2012, just under three years from the date I first signed up for Bullfrog Power electricity (and just through a couple of simple clicks of my mouse! ), I received a certificate in the mail from Bullfrog titled, “Recognition of Leadership” and it congratulated my family on playing an active role in advancing clean energy in Canada. The certificate went on to display for me that, to date, 15,014 kilowatt hours (kWh) of green electricity had been injected into the Canadian energy systems on my behalf, meaning that my emissions footprint had been reduced by 2.4 tonnes of greenhouse gases, 3.3 kilograms of nitric oxide, and 5.9 kilograms of sulphur dioxide since 2009. I was tempted to frame it and display it next to my university degrees in my office, but I instead harnessed my pride in what I had become involved in and chose to share via word-of-mouth my enthusiasm for Bullfrog, what they stand for, and what they accomplish. So when people ask, I inform them that yes, I pay more for my already-pricey electricity and natural gas because I have chosen to actually take action on climate change instead of just talk about it. I aim to inspire others to lead the way towards a renewably powered future (and may I just say how excited I get when I spot the leaping green frog symbol on someone else’s front lawn or in the storefront of a local business?!). I’m always prepared for the argument that paying extra is just not worth it in order to make our planet that much cleaner, but it rarely ever comes. Kelly McConnell lives in London, Ontario with her son and two dogs and enjoys connecting with the natural world through regular hiking, cycling, travelling and through her various roles (past and present) as nature interpreter, humane educator, creative writing group facilitator, and mental health and addictions counsellor. Kelly graduated from McMaster University with an M.A. in Sociology and an Honours B.A. in English and Sociology. McMaster’s GUCEL program bridges collaboration and sustainability.